The Campus Life view lets you manage room and meal info, Campus Life fees, custom info, and violations and consequences. It preserves the historic record of these items and also lets you add and update new information. Although we use the word student, remember that everyone in Populi has the Campus Life view. This comes in handy when you have, say, a professor visiting from overseas take up residence in school housing for a semester. Or maybe you have a hotshot donations guy who nonetheless keeps parking his Maserati in the president's parking space—and so continually racks up the parking tickets. The Profile > Campus Life view is accessible to Financial Admin, Academic Admin, Registrar, and Campus Life users. Click the gear above Campus Life Information to export a PDF of the student's class schedule. Click add next to Room Plan History. 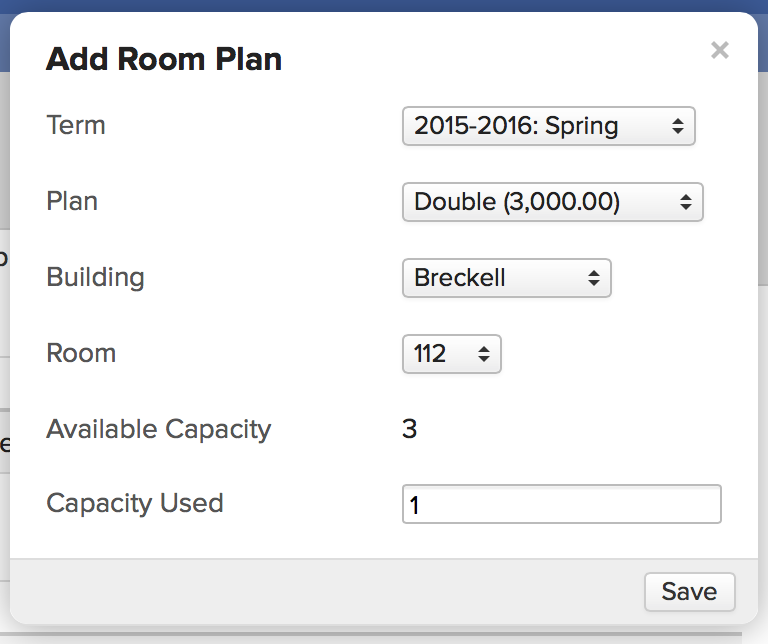 Now that you've added the room plan and assignment, a pending room charge is generated on the student's Financial > By Term tab. You can edit that charge either here or there until the charge is invoiced. means the charge has not yet been invoiced; you can still edit it or delete it. means that the charge has been invoiced; there's nothing more you can do with it on the Campus Life view. You can manage rooming arrangements on the room management page. Click add next to Meal Plan History. Select the meal plan you wish to apply. Now that you've added the meal plan, a pending charge is generated on the student's Financial > By Term tab. You can edit that charge either here or there until the charge is invoiced. These fees are also visible on the student's Profile > Financial > Dashboard. The fees here may have been manually-added or triggered by the recording of a violation or consequence against the student. 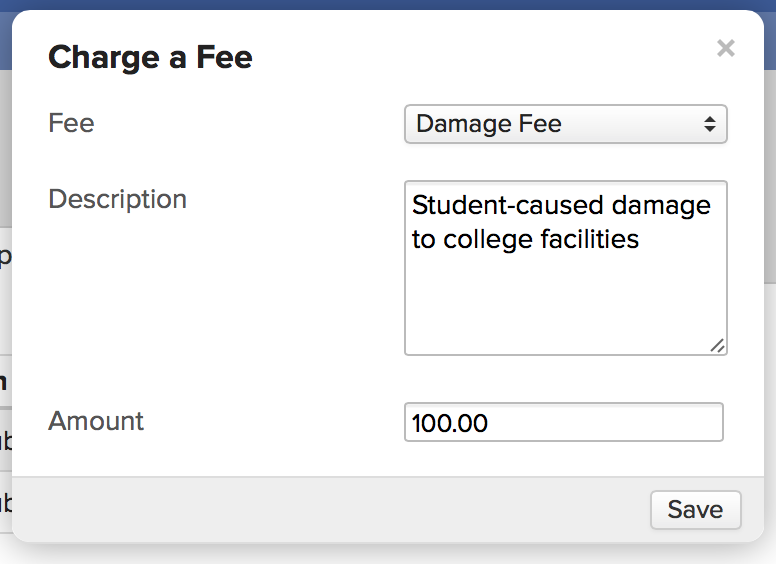 If the violation or consequence that triggered the fee is deleted, the fee will also be deleted (if it is still set to pending). Fees marked with have not yet been invoiced; you can still edit or delete them. Fees marked with have been invoiced; there's nothing more you can do with them on the Campus Life view. Click add next to Campus Life Fees. Select the fee you'd like to add from the drop-down. These, obviously, are the campus life fees that were selected during setup. If you like, edit the description and amount. Or just leave them be. It is also visible (and editable) on the student's Profile > Financial > Dashboard. A student billing or financial admin user must invoice it. Remember that the fee you've added is not tied to an academic term (in case that's important...)! Here you'll be able to add and review the custom fields you created for Campus Life. Click add next to Custom Info. Select the custom field you want to add and fill it in. Now that you've added this field, it can be included in the spreadsheet you create when you export any of the Campus Life reports. Here you'll find a record of all of the violations and/or consequences recorded against this student. Violations—including any associated fees—automatically apply to the student's record. Consequences can be set to pending, applied, or waived. Pending: the consequence is still in some sort of review. Applied: the consequence—and any fees—have been enforced against the student. Waived: someone has decided not to enforce the consequence; any fees have also been deleted. Consequences can be manually-added or may have been triggered by one or more violations. Click add next to Violations & Consequences. Select whether you wish to add a violation or consequence. Choose the item you wish to record against the student. If you wish, edit the description. If you choose to email a notification about the violation/consequence, the description will be included in the message. If you're adding a consequence, select the status. 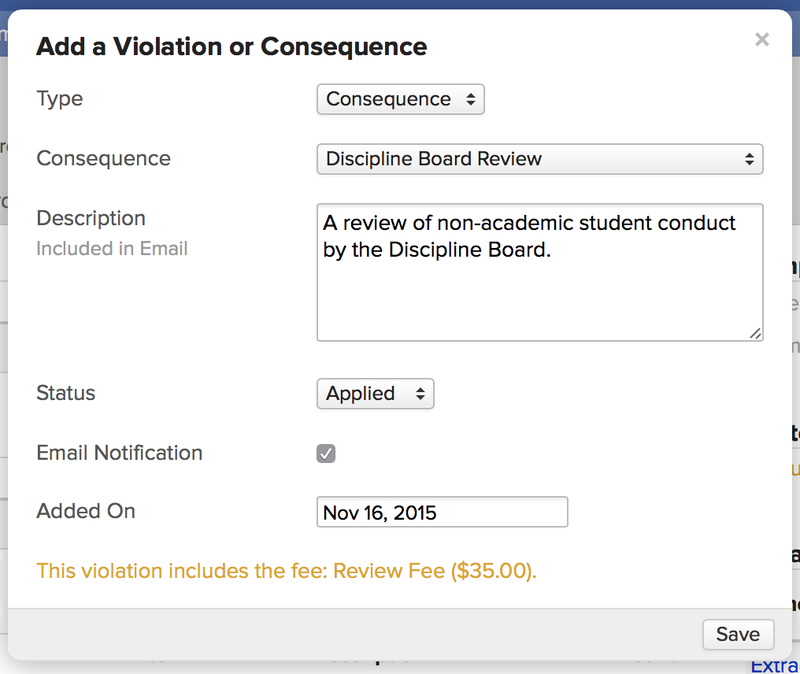 If you're adding the violation or are applying the consequence, check if you wish to email a notification to the student. The email will include all of the details, including the description. Edit the applied date if you wish. You'll see any associated fees in the Campus Life Fees panel and the student's Profile > Financial > Dashboard. The fee must still be invoiced. The violation might trigger a consequence. The item will appear in the appropriate Campus Life report. To change a pending consequence's status to applied or waived, you'll need to edit the consequence. ...UNLESS you've manually-edited the fee (say, changed the description) or the fee has been invoiced.